Happy Friday everyone! 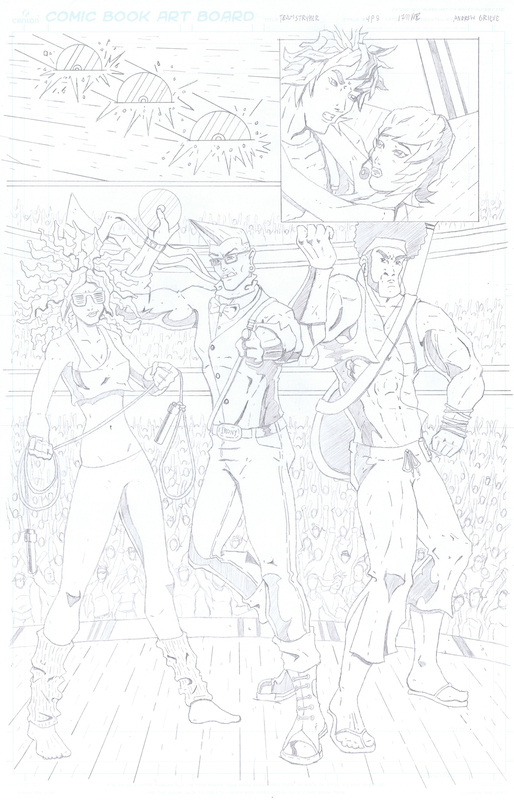 As you’re getting set for your weekend I hope you enjoy seeing the pencils to the Hip Squad’s debut page! This was the first time I got to draw HS besides their character sheets so it was really fun to get to see them in action. When drawing new characters for the first time it can be hard to try and recreate what you had originally designed. Drawing characters standing still from the front, side and back is very helpful in keeping all the details the same but it can be difficult to recapture the character once they are put into motion. When I first drew Piers it was hard to fit all expressions into his face that I wanted. Having a character with glasses can be difficult as they take of a up a lot of real estate. I had to go and raise his eyebrows so you get the full impact of the expressions he needs to make. What did you think of the Hip Squad’s debut?! Let me know in the comments below!